Carabins volleyball hitters Emmanuel André-Morin and Laetitia Tchoualack, in the third year of the BBA program and the first year of the MSc in Administration program respectively, have certainly shown that they know how to combine studies in business with élite sports. Emmanuel and Laetitia were crowned “players par excellence” for the second and third straight years respectively by the Fédération québécoise du sport étudiant (FQSE), which recently announced the individual annual award winners in men’s and women’s university volleyball. Emmanuel, now in his third year with the Carabins, also played on Quebec’s first all-star team for the third time. He finished his season with 328 kills – 101 more than any other player in the Quebec association – and 365 points, or 121 more than the next-best player in the rankings. He is also in the running for the Dale Iwanoczko Award, presented to an athlete for outstanding achievement in volleyball, academics and community involvement. In 2008 Emmanuel took part in the income-tax clinic organized by the Société de relations d’affaires of HEC Montréal. 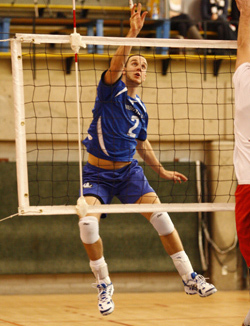 For two years now, he has been training young players on the Club de volleyball Celtique, and has also begun sponsoring a high-school student through the Université de Montréal SEUR project, to encourage secondary students to pursue university studies and research. In her four years with the Carabins, Laetitia Tchoualack has racked up impressive offensive statistics – first in Quebec for kills (237) and kills per game (4.23), and second for points (288). These results earned her a place on the first all-star team for the fourthtime. 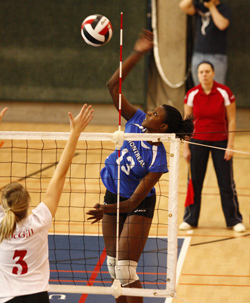 In 2007-2008 she took the BLG award as overall Canadian female athlete of the year, for her outstanding sportsmanship, demonstrated leadership and academic excellence. The award came with a cash prize of $10,000 to go toward higher studies at a Canadian university. Laetitia is known for her willingness to help other players, both veterans and newcomers. “She is an exceptional leader who has made the most of her experience on the professional circuit, playing on the French national team from 1996 to 2004,” says Olivier Trudel, head coach of the Carabins women’s volleyball team.